It is fascinating to read about the cycling subculture of different countries and how they have progressed. The European racing epicentres—France, Belgium, Italy—are well known for their structured systems, in place for decades, while other countries have made rapid strides so that it is no longer unusual to see British, American or Australian riders on the podium. But in the end it all comes down to individual talent and the will to win. A new autobiography by world-class pursuiter and proud Western Australian Steele Bishop explains what it took to grab a rainbow jersey in 1983. Western Australia covers one-third of the nation and 80% of its population lives around the capital city of Perth, so it would seem that the opportunities for racing would be limited. 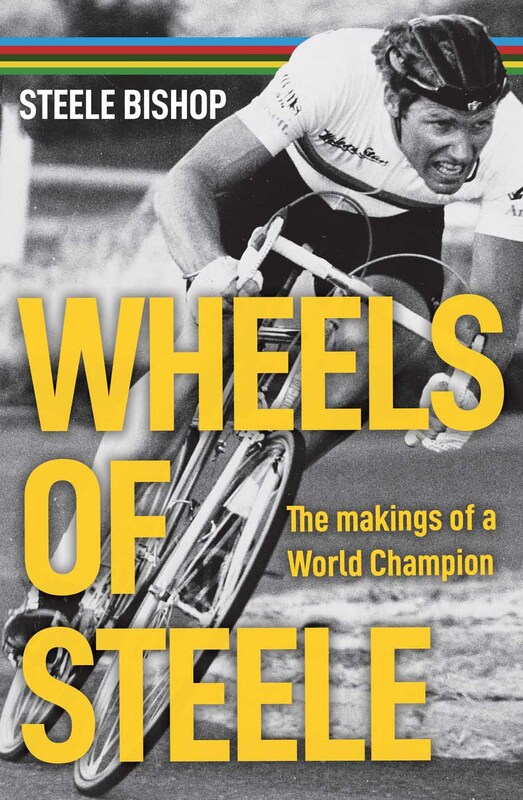 This was not the case as Steele Bishop relates his life story, “Wheels of Steele.” Growing up near Perth in the 1960s, he fell in love with cycling at an early age and soon achieved considerable success as a junior rider. He competed on the road but it was evident that the had a particular talent for the track. He was soon winning state championships but this was not enough so he moved to Melbourne, believing that the best rides were in Victoria. His goal was to get to the 1976 Montreal Olympics, five years in the future. His career took an unusual arc as he managed, aged 18, to end up on the national pursuit team. It was not planned that this team would go to the Olympics in 1972 but the team was given the chance to see if it could set a qualifying time and Bishop set an Australian record, so off they went to Munich. 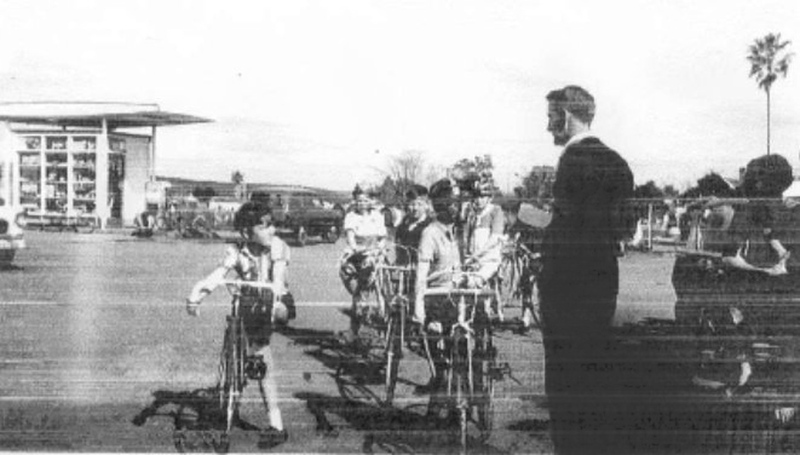 He had reached the Olympics four years earlier than expected and was the youngest cyclist participating. But the 1972 Olympics were for amateurs and that meant a scramble to find sufficient funds to send the team to Europe. 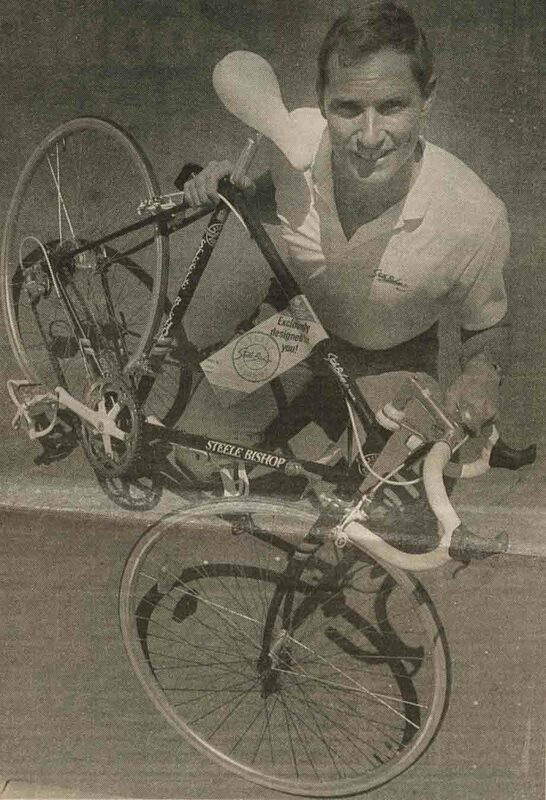 In those innocent days before comprehensive commercialization, money was a big issue and it is remarkable that Bishop's hometown took up a collection to buy him a new bike. 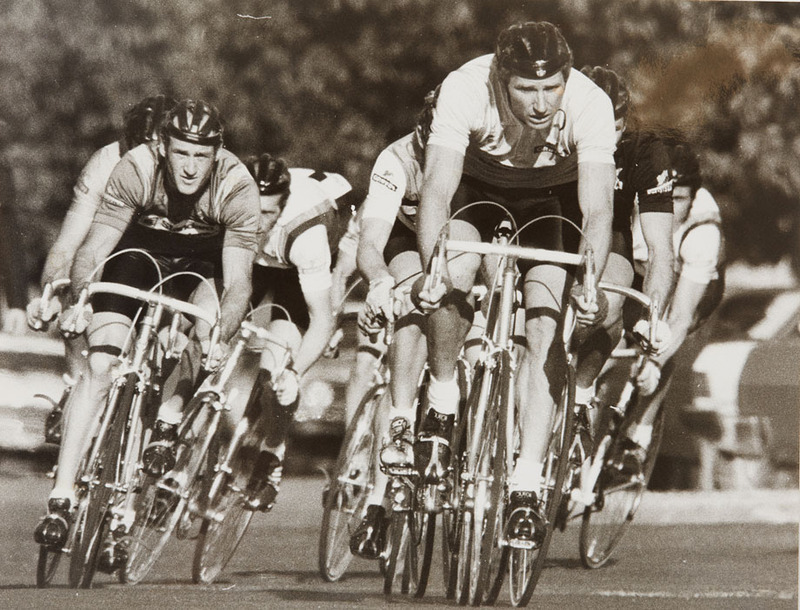 Although Australians had competed in the Tour de France and track events starting in the 1920s, arriving in Europe was still an unforgettable experiences for the lads from Down Under in 1972. One tends to forget who difficult it was for foreigners to adjust to cycling life in Europe. Although Bishop did not get very far in the Olympics he was encouraged enough to return to Europe the following year for a crack at the World Championships in Spain. Amazingly, Australia had never sent a national team to an international events except the Olympics. He spent five months training in Holland, surviving on prize money from regional races, but ultimately failed to qualify for the pursuit race. However, he had come to realize that he had made a fundamental error: his goal had been to participate—it should have been to be there to win. 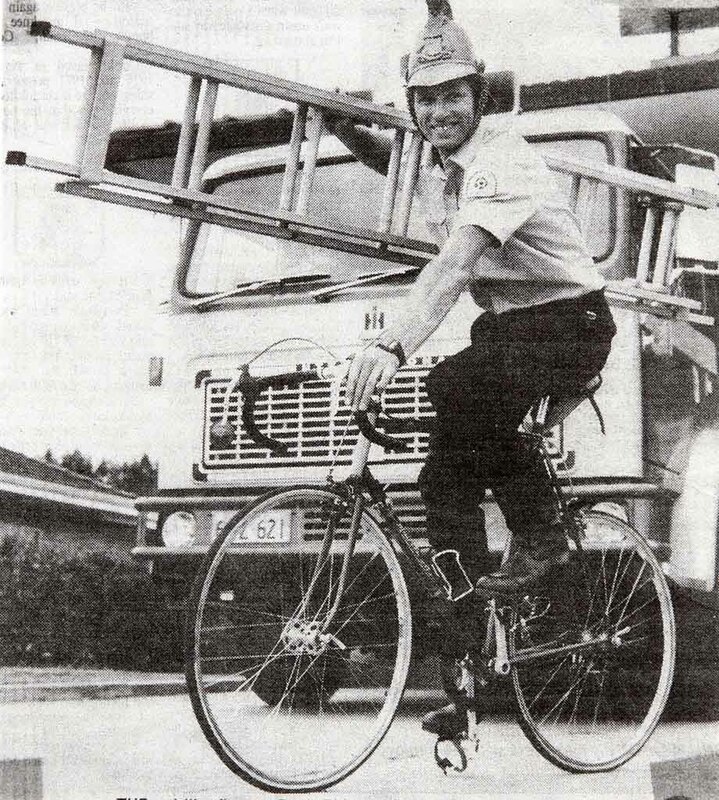 Returning to Australia, the now 20-year old Bishop retired from cycling and became a fireman. This occupation left him with a flexible schedule and he was to put this to good use in the future. After not racing for five months, he was persuaded to turn professional and did so in January 1975. He mentions the friction between the amateur organizations and those who were pros, which seems to have been as much a part of Australian cycling as their weird handicap racing system. Between 1975 and 1984 Bishop seems to have been pretty much unbeatable in his events in Australia. 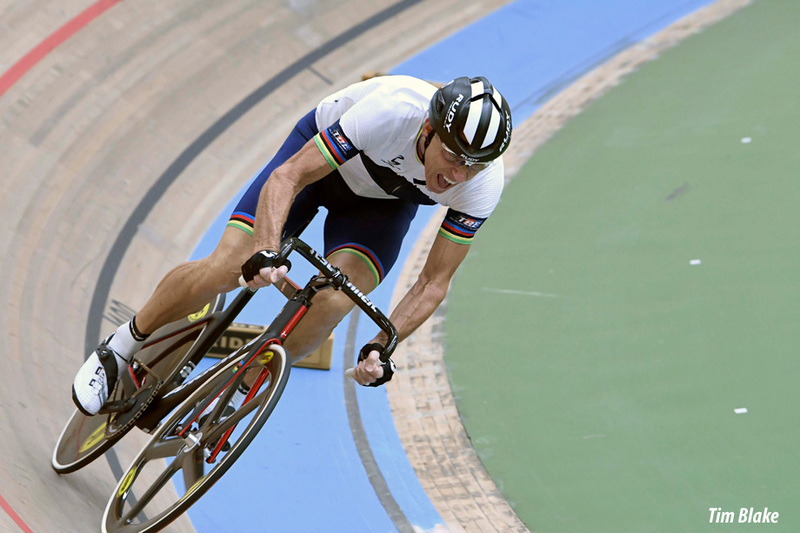 He won 13 national titles, as well more than 30 state titles on the road and track, with successes in points and keirin races as well as his speciality, the 5,000 m pursuit, where he consistently dropped the national record seemingly every year. While the book does refer to these at some length, the highlight of the book is certainly his attempt at the pursuit title at the Worlds in Switzerland in 1983. He had planned to end his career at the Australian National Championships as the fire department was unwilling to give him enough time off to try for the Worlds but upon winning the Western Australia Sports Star of the Year Award, he discovered he was now entitled to do so, thanks to the intervention of the state premier. For anyone wondering what it takes to compete at this level, Steele Bishop's preparation would seem to be a checklist and miles ahead of what he did a decade before as an amateur in Munich. He arrived with his support group three months early and, although based in Switzerland in that time, competed in a lot of criterium races on the Continent, as well as flying out to England for events there each week, to get his legs into the proper condition. His support group gets a lot of mention. 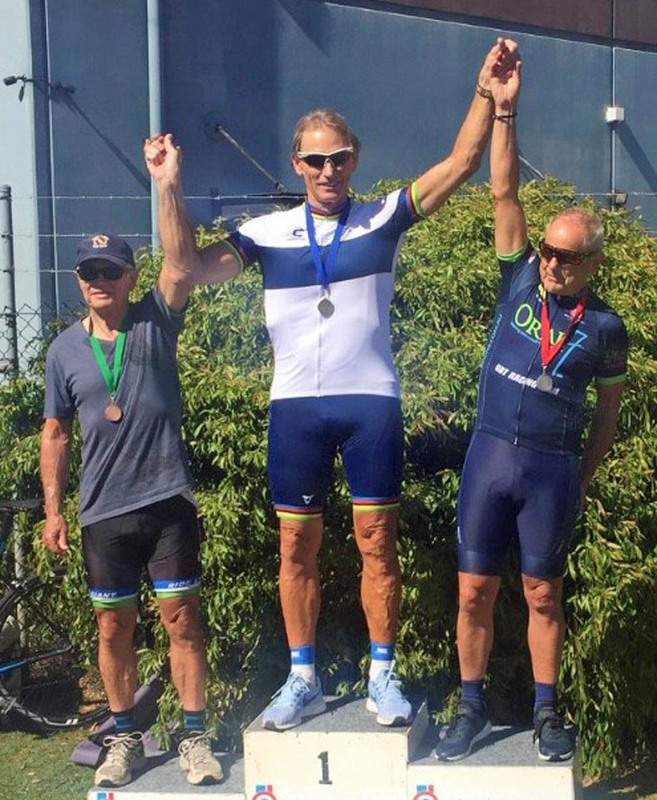 He had a coach, a chiropractor, a fitness coach/nutritionist/mental trainer, riding partner/mechanic and massage person at various points as he achieved his success and he is generous in praise of them. His training program not only included a lot of time on the road and track sessions, but also exercises in water and even some ballet moves. However, he attributes a great deal of his success to mental training, claiming that the Worlds it was 80% mental to 20% physical. This would have been advanced thinking in the early 1980s. 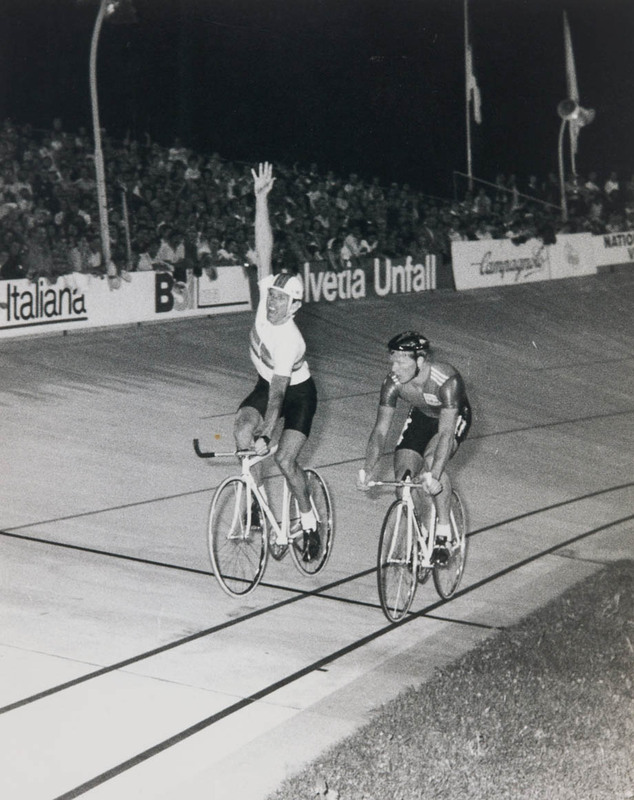 Bishop's prose is not flowery but his direct style well suits his account of the days at the Oerlikon Velodrome in Zurich and how he moved up in the competition until that supreme moment when he came through the tunnel and saw 10,000 cheering spectators as he prepared to start the ride of his dreams. There is strategy involved and being able to read your opponent, of course, but one can only imagine just how hard it would be to ride 5 kms at this kind of effort. Nobody is given a rainbow jersey. His next goal will be setting a new masters record at the Australian nationals in Brisbane in April. It would take a foolish person to bet against him, I suspect. There are two appendices in the book, the second being his impressive palmarès. While much has been made of the motivational aspects of Bishop's life, the first appendix is a list of his “tips for success on (and off) the track” that is a nice summary of what worked for him but, frankly, reading what he accomplished as a racer is far more persuasive than some common-sense platitudes. Steele Bishop's name may not be very familiar to non-Australians, but this autobiography—a story of dedication, enthusiasm and beating the odds is well worth the read. Photos from the author's private collection. A Kindle Edition of “Wheels of Steele: The Makings of a World Champion” by Steele Bishop is available from AMAZON.COM for $12.62. Read the PEZ interview with Steele Bishop. When not reminiscing about his own track experiences (three outings, one of which involved falling over), Leslie Reissner may be found going around in circles at www.tindonkey.com.